No pro guitarists were able to reach the pinnacle without having a good set of pedals on their pedal board. Of course, this should include the best compressor pedal. After all, the emulation of quality sustains is the forte of this effects pedal. Unlike other types of guitar pedal, a compressor doesn't alter the tone of your instrument. For example, fuzz, overdrive, and distortion pedals can make a monotonous tone into an ear-shattering sound. Compressor pedals are not like them. However, it doesn't mean that they are useless. In fact, they might be the missing piece of your arsenal. Compressor pedals are for increasing sustains. While other pedals can do this, only the compressor can amplify sustains at a distinctively high level. Therefore, it is an ideal choice if you are into country, funk, acoustic, and jazz. However, its function is not only limited to those. In this article, we will show the best compressor pedals that are on the market today. Moreover, we will also give you a buying guide that can help you to choose which pedal will suit your needs. So what are we waiting for? Let us get started. One of the best compressor pedals today is the Xotic SP Compressor. It has a compact design, which makes it ideal for different setting and usage. It doesn't consume too much space and leaves a small footprint. The chassis is commendable, too! The Xotic SP Compressor is a replica of the Ross Compression (a legendary compressor pedal). Many tried to mimic the latter but failed. Only the SP Compressor were able to achieve feats that come close to Ross. Regardless of which angle you look this pedal, you can only say one thing: it is truly excellent! Comes with blending option for smooth transition. ​Possesses three-way switch for high, mid, and low signals. ​Tones are immaculately precise and articulate. It can get noisy during mid-to-high switches. Pedals can perform excellently are pretty rare these days. This is despite the fact that the proliferation of pedal manufacturers never cease. Luckily, the Wampler Ego Compressor is among those that can save the day. When it comes to polishing your guitar tones, you can trust to this pedal. "Refined" is the word that perfectly matches the Wampler Ego Compressor. Although it has a bland appearance, its performance is simply breathtaking. The controls are straightforward and easy to learn. Moreover, it has quality features that make it versatile in any usage. One of the best things that you will like about Wampler Ego Compressor is its price. Specifically, it gives value to your money, considering the features it offers you. In short, it is like getting more than what you have paid for! Quality film resistors and capacitors for superior responsiveness. ​The blend control does not give artificial coloring to the tone. ​Sustains are organic and warm. Gives off a little noise when compressing distorted sounds. It doesn't have a volume boost. The MXR M102 is a descendant of the 1995 compressor pedal that the Dyna Comp released. The latter has still a good rapport even today, especially to pro guitarists. That's why when the MXR M102 became available on the market, almost everyone wants to hoard it. As of now, the MXR M102 is among the most popular compressor pedals. It comes with advanced features that its predecessor lack, such as the "in-line" compression mechanism. Specifically, this one balances the signal for better sound attenuation. Moreover, you will love the authenticity of its sustains. It can last long and emanates a genuine feeling. Of course, this compressor pedal won't make the cut if it is not that versatile! ​Tone reproduction is smooth and warm. ​Comes with intuitive interface and ergonomic controls. Lacks fine adjustments for better precision in sound regulation. It is not a good choice if you are using high-pick ups. If there is one thing that is constant in the universe of effects pedals, that would be Boss alone. From distortion pedals down to compressors, this brand has them all. Other brands are inconsistent, but Boss is different. The excellence in the performance and features of their pedals remains the same throughout the years. For example, the Boss CS-3 Compressor Pedal has an amazing sound attenuation mechanism. It is specifically a sustainer/compressor mix that comes with different frequency range controls. This pedal can keep your sustains alive longer than you expect it. Moreover, the responsiveness of this pedal is something that you will certainly love. You can regulate any frequency without compromising the authenticity of the sound. You cannot see qualities like this every day! Excellent sound control without losing the original sound. This pedal is highly versatile; thus it is ideal for various genres. ​Good construction (hardware are very rigid). It is better for Boss to integrate this one with the NS-2 because they are bound to be used together. Looking for a compressor pedal on a tight budget is an ordeal. However, it doesn't mean that this one is an impossible task. As a proof of that, we will be presenting the Joyo Jf-10 Compressor Pedal to you. This unit possesses the features that those expensive brands flaunt. Specifically, Joyo Jf-10 prides its simplicity but versatile performance. It is very user-friendly but is capable of regulating frequencies as if they are a piece of cake. Once you can get to hear the quality of this pedal, you would ask yourself why it is so inexpensive. Rigid construction and compact design. ​Overall performance can match those medium-priced compressors. ​Capable of attenuating multiple frequency ranges. ​Usable in studio recordings and live gigs as well. The footswitch and knobs of this pedal have lesser qualities compared to other brands. Skip this one if you need a heavy duty squash. The term "compression" in the music industry is quite a simple concept. Specifically, it is a type of volume attenuation. To put it simply, it can make quiet sounds loud and noisy sounds quiet. The importance of attenuating volume can be heard on the sustains. Of course, every guitarist would love to improve the quality of the sustains they produce. A chord that can ring for a long time without diminishing is a pure music to the ears. A compressor pedal is unique, even among the available effects pedal out there. It is the only pedal that doesn't distort the tone of your instrument. It can squish any unreasonable loud sound until such time it can be tolerable. Moreover, it can boost your signal to convert soft notes into something dynamic. If your ears are craving for a clean, articulate sound without the punch of overdrives, then a compressor pedal is your top choice. 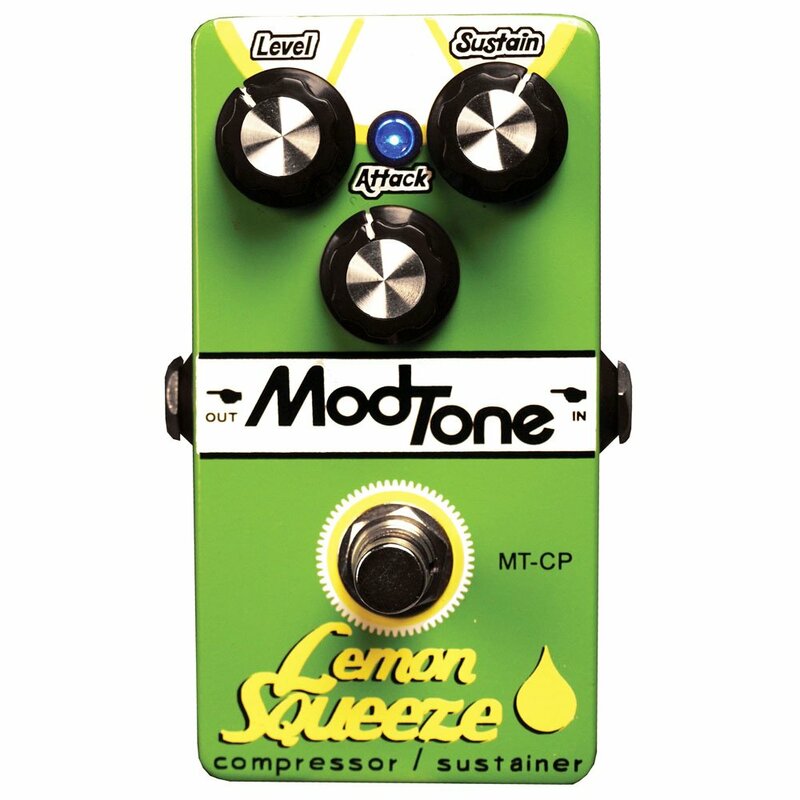 The effects that a compressor pedal give are ideal for genres that require clean sound output. As we mentioned earlier, these musical styles would be acoustic, funk, country, and jazz. However, many audio engineers are using an advanced type of compressors (rackmount or software) for various studio purposes. We know that you are looking for a compressor pedal. But at the same time, we are quite aware that there still some hint of reluctance inside of you. Do you need a compressor pedal? Compression is a huge plus in your arsenal. If you are seeking to optimize the volume of a particular part for it to appear on the mix, then you need a compressor. For example, harp harmonics, legato hammer-ons, and pull-offs are quiet by default. These tones are fantastic. However, if they do not stand out, there would be no harmony in your piece. Of course, compressor pedals are still useful on rocks and blues. The quality sustains that it can produce can certainly give you a satisfying performance. Don't get us wrong. Distortion pedals are good for sustains, too. However, they have the tendency to lose sound articulation, especially if you spike them up at higher volumes. Such instances are ideal for genres like metal. But for moderate musical genres, the loss of articulation is not acceptable. Meanwhile, bass guitars can also benefit from compressor pedals. We all know that this instrument is susceptible to produce low-frequency sound. As a result, it usually leads to amplitude spikes, which are not good. A compressor pedal suppresses those spikes effectively. Therefore, as long as you got this pedal, you can do all those fingerstyle and slapping techniques without worries. Here are the types of compressor pedals that you can see on the market today. Voltage Controlled Amplifier (VCA) - This type of compressor pedal are best for studio and recording purposes. They have the least tendency to add artificial colors to your sound. Moreover, they produce crystal-clear tones, too. A VCA is the best if you are looking for a responsive and transparent compressor. ​Field Effect Transistor (FET) - Another type of studio pedal, the FET is quite similar to the VCA in regards to their features. However, FETs can somehow add color to your sounds, especially if you are using a power transformer. Sound coloring could also happen if you amplify the default controls. ​Optical Compressors - This kind of compressor pedal uses photoresistor and light source to regulate your sound signals. Because of this mechanism, optical compressors tend to produce natural and smooth sounds. Moreover, they are notorious for making slow releases, too. ​Tube - If you are seeking for smoothness, color, and warmth to your signals, then a tube compressor is the one for you. Multiband - A multiband compressor uses compression software for sound attenuation. It can effectively sever your signals and arrange them into their respective frequency bands. For precise sound control and compression, a multiband compressor is the best choice. If you are planning to look for other compressor pedals, do not think that the price makes the cut. Instead, always be conscious of your budget. Moreover, it is better if you are aware of your needs. In this way, you will be able to decide which features will you want for your pedal. Otherwise, you will just be wasting your money on something that is useless. A compressor pedal is an essential tool for any guitarists. Of course, aside from pushing your playstyles to the limit, you also need to learn about controlling the tones as well. Otherwise, you will never be able to enhance your skills. Regardless of the genre, compressor pedals are necessary. Among the featured best compressor pedals here, we deem the Xotic Effects SP as the best compressor pedal. It has the qualities that can suit for various purposes. It can cap off or boost any signal without losing the original texture of sound. Moreover, it avoids artificial tone coloring, which makes it ideal for live performances and recordings. Of course, we recommend that you should test all the compressor pedals on this list. You will never know which one will suit your taste until you tested them already! Did you learn from this article? Read more of our product reviews and guides by subscribing on this website. Also, do not forget to drop your comments and questions in the box down below!